Preston Bus is going to bid a fond farewell to its fleet of nine Leyland Olympian double-decker buses with special ‘last in service’ days. As the vehicles are approaching the ripe age of 25, the operator has decided to retire them from active service but not before giving them all a final run. Despite a strong fleet of 28 Olympians, the numbers have whittled down over the years as vehicles have been scrapped, preserved or replaced. To celebrate the end of an era, the operator has decided to run the remaining nine vehicles whenever possible on services, 8, 23 and 35. Enthusiasts and fans are welcome to come and ride the service or take pictures at Preston Bus Station and along any of the routes. 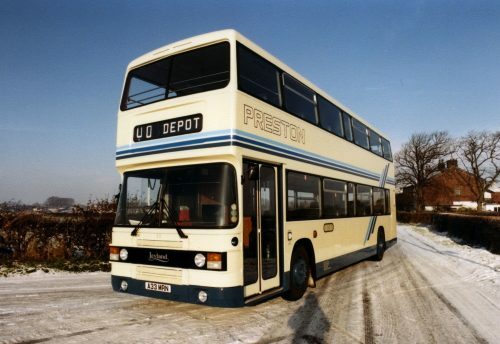 The first Olympian in service at Preston Bus was a former Leyland Vehicles demonstrator with Eastern Coachworks bodywork in 1984. 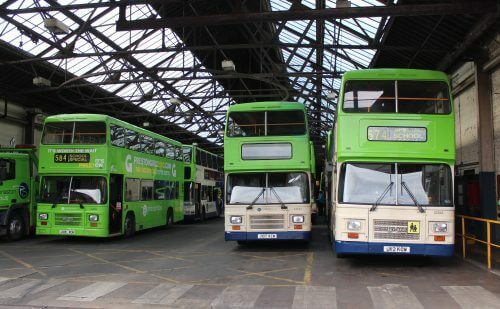 The second arrived in 1989 and again was a former demonstrator with bodywork by Northern Counties of Wigan and by 1990 there were four new additions to the fleet, all of which were Leyland Olympians built at Leyland’s Workington factory. In 2005, 10 were purchased from Edinburgh-based Lothian Buses that still had centre doors which were removed by an outside contractor before entering service. These journeys can be matched up with normal Saturday timetables on these routes. Pick up a timetable from the bus station or see the website for further details.